The phosphorus compounds serve as major building blocks of many biomolecules, and have important roles in signal transduction. The phosphate is involved in many biochemical reactions by the transfer of phosphoryl groups. All living cells sophisticatedly regulate the phosphate uptake, and survive even under phosphate-limiting condition, and thus phosphate metabolism is closely related to the diverse metabolism including energy and central carbon metabolism. In particular, phosphorylation may play important roles in the metabolic regulation at acidic condition and nitrogen limiting condition, which typically appears at the late growth phase in the batch culture. Moreover, phosphate starvation is a relatively inexpensive means of gene induction in practice, and the phoA promoter has been used for overexpression of heterologous genes. A better understanding of phosphate regulation would allow for optimization of such processes. The effect of phosphate (P) concentration on the metabolism in Escherichia coli was investigated in terms of fermentation characteristics and gene transcript levels for the aerobic continuous culture at the dilution rate of 0.2 h-1. The result indicates that the specific glucose consumption rate and the specific acetate production rate significantly increased, while the cell concentration decreased at low P concentration (10% of the M9 medium). The increase in the specific glucose uptake rate may be due to ATP demand caused by limited ATP production under P-limitation. The lower cell concentration was also caused by less ATP production. The less ATP production by H+-ATPase may have caused less cytochrome reaction affecting in quinone pool, and caused up-regulation of ArcA/B, which repressed TCA cycle genes and caused more acetate production. In the case of phoB mutant (and also phoR mutant), the fermentation characteristics were less affected by P-limitation as compared to the wild type where the PhoB regulated genes were down-regulated, while phoR and phoU changed little. The phoR gene knockout caused phoB gene to be down-regulated as well as PhoB regulated genes, while phoU and phoM changed little. The effect of pH together with lower P concentration on the metabolic regulation was also investigated. In accordance with up-regulation of arcA gene expression, the expressions of the TCA cycle genes such as sdhC and mdh were down-regulated at acidic condition. The gene expression of rpoS was up-regulated, and the expression of gadA was up-regulated at pH 6.0. In accordance with this, PhoB regulated genes were up-regulated in the wild type under P-rich and P-limited conditions at pH 6.0 as compared to those at pH 7.0. Moreover, the effect of nitrogen limitation on the metabolic regulation was investigated, where the result indicates that phoB gene was up-regulated, and PhoB regulated genes were also up-regulated under N-limitation, as well as nitrogen-regulated genes. The present result shows the complicated nature of the metabolic regulation for the fermentation characteristics upon phosphate limitation, acidic condition, and nitrogen limitation based on the transcript levels of selected genes. The result implies that the regulations under phosphate limitation, acidic condition, and nitrogen limitation, which occur typically at the late growth phase of the batch culture, are interconnected through RpoS and RpoD together with Pho genes. The phosphorus compounds serve as major building blocks of many biomolecules, and have important roles in signal transduction . The phosphate is contained in lipids, nucleic acids, proteins, and sugars, and is involved in many biochemical reactions by the transfer of phosphoryl groups . Moreover, phosphate metabolism is closely related to the diverse metabolisms such as energy and central carbon metabolisms . All living cells sophisticatedly regulate the phosphate uptake, and survive even under phosphate-limiting condition [4, 5]. Escherichia coli contains about 15 mg of phosphate (P) per g (dry cell weight) . Depending on the concentration of environmental phosphate, E. coli controls phosphate metabolism through Pho regulon, which forms a global regulatory circuit involved in a bacterial phosphate management [1, 7]. The PhoR-PhoB two-component system plays an important role in detecting and responding to the changes of the environmental phosphate concentration [8–10]. It has been known that PhoR is an inner-membrane histidine kinase sensor protein that appears to respond to variations in periplasmic orthophosphate (Pi) concentration through interaction with a phosphate transport system, and that PhoB is a response regulator that acts as a DNA-binding protein to activate or inhibit specific gene transcription [1, 11–13]. The activation signal, a phosphate concentration below 4 μM, is transmitted by a phospho-relay from PhoR to PhoB. Phospho-PhoB in turn controls Pho regulon gene expressions. PhoB is phosphorylated by PhoR under phosphate starvation or by PhoM (or CreC) in the absence of functional PhoR [14–20]. The E. coli Pho regulon includes 31 (or more) genes arranged in eight separate operons such as eda, phnCDEFGHIJKLMNOP, phoA, phoBR, phoE, phoH, psiE, pstSCAB-phoU, and ugpBAECQ. When Pi is in excess, PhoR, Pst, and PhoU together turn off the Pho regulon, presumably by dephosphorylating PhoB. In addition, two Pi-independent controls that may be form of cross regulation turn on the Pho regulon in the absence of PhoR. The sensor CreC, formerly called PhoM, phosphorylates PhoB in response to some (unknown) catabolite, while acetyl phosphate may directly phosphorylate PhoB . When Pi is in excess, Pi is taken up by the low affinity Pi transporter, Pit. Four proteins such as PstS, PstC, PstA and PstB form an ABC transporter important for the high-affinity capture of periplasmic inorganic phosphate (Pi) and its low-velocity transport into the cytosol . These proteins are encoded together with PhoU as the pstSCAB-phoU operon. PstS is a periplasmic protein that binds Pi with high affinity. PstC and PstA are innermembrane channel proteins for Pi entry, while PstB is an ATP-dependent permease that provides the energy necessary for Pi transport from periplasm to cytosol. When phosphate is in excess, the Pst system forms a repression complex with PhoR, and prevents activation of PhoB. PhoU and PstB are also required for dephosphorylation of phospho-PhoB under P-rich condition . Indeed, PhoU is essential for the repression of the Pho regulon under high phosphate condition . It may be considered that PhoU acts by binding to PhoR, PhoB or PhoR/PhoB complex to promote dephosphorylation of phosphorylated PhoB or by inhibiting formation of the PhoR-PhoB complex . It has been shown that phoB mutant does not synthesize alkaline phosphatase (phoA gene product) [25–30] and phosphate binding protein (pstS gene product) [26, 29, 30]. It was observed that phoU expression changed depending on phosphate concentration of the phoB mutant . Since the phoA gene mutation leads to the decreased content of membrane proteins or completely lacks them, mutations in the phoB gene result in the loss of alkaline phosphate and two membrane proteins . Nesmeianova et al. found that phoB mutation leads to loss of polyphosphate kinase activity which catalyzes the synthesis of polyP in E. coli. Ault-Riché et al. also found that the strains with deletion of phoB failed to accumulate polyP in response to osmotic stress or nitrogen limitation. Mutations in the phoB gene had no effect on pepN and lky (tolB) expressions . The expressions of the genes under the control of the PhoR-PhoB two-component system were found to be affected by the duration of P-limitation in response to phosphate starvation in E. coli. This means that the roles of the PhoR-PhoB two-component regulatory system seem to be more complex . Although molecular level regulation by PhoR-PhoB under P-limitation has been investigated as stated above, little has been investigated about the effect of P- limitation on the overall metabolism and fermentation characteristics of E. coli so far. 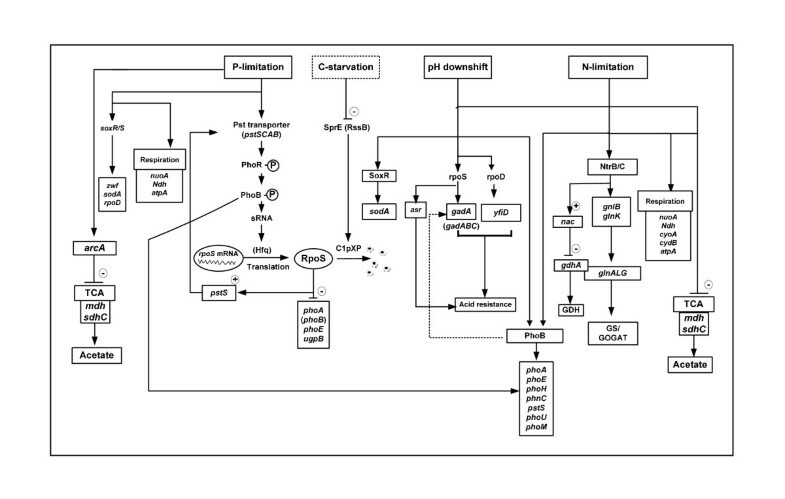 In the present study, therefore, we investigated the effect of phosphate limitation on the cell metabolism in E. coli in view of fermentation characteristics and gene transcript levels, since it is quite important for the development of microbial cell factories to understand the fermentation mechanism at the late growth phase in the batch culture, where nutrient starvation occurs. Moreover, the effect of phoB gene (and also phoR gene) knockout on the metabolism was also investigated under both P-rich and P-limited conditions to clarify the role of phosphate regulation. Since it has been implied that phosphate regulation is interconnected with acid tolerance and nitrogen regulation, we also investigated the effect of pH downshift and nitrogen limitation together with P-limitation on the metabolic regulation in E. coli, where those phenomena also occur at the late growth phase of the batch culture. Since phosphate starvation is a relatively inexpensive means of gene induction in practice, the phoA promoter has been used for overexpression of heterologous genes . A better understanding of the Pho regulon would allow for optimization of such processes . In order to make clear the effect of phosphate limitation on the metabolism, aerobic continuous cultivation was conducted at the dilution rate of 0.2 h-1 under different P concentrations. Additional file 1a shows the effect of P concentration on the fermentation characteristics of the wild type strain, where it indicates that the fermentation characteristics significantly changed when feed P concentration became low around 10% of the M9 medium. In particular, the specific glucose consumption rate and the specific acetate production rate became significantly higher, while cell concentration became significantly lower under such P-limiting condition. Table 1a also shows the detailed values. Fermentation characteristics of the wild type E. coli and its phoB and phoR mutants in the aerobic chemostat culture under different phosphate concentrations at the dilution rate of 0.2 h-1 at pH 7.0. Note: " - " indicates that no data was collected for this condition. The standard deviation was obtained by triplicate measurements. Figure 1 shows the effect of P concentration on the transcript levels, where Figure 1b indicates that phoB transcript level increased as P concentration decreases, and phoB regulated genes such as phoA, phoE, phoH, phnC, pstS, and ugpB were all increased in a similar fashion, and eda transcript level also changed in a similar fashion (Figure 1c). Note that phoU and phoM changed in a similar fashion as phoR, and also that the transcript level of rpoD, which encodes the RNA polymerase holoenzyme containing σ70, increased in a similar fashion as PhoB regulatory genes . 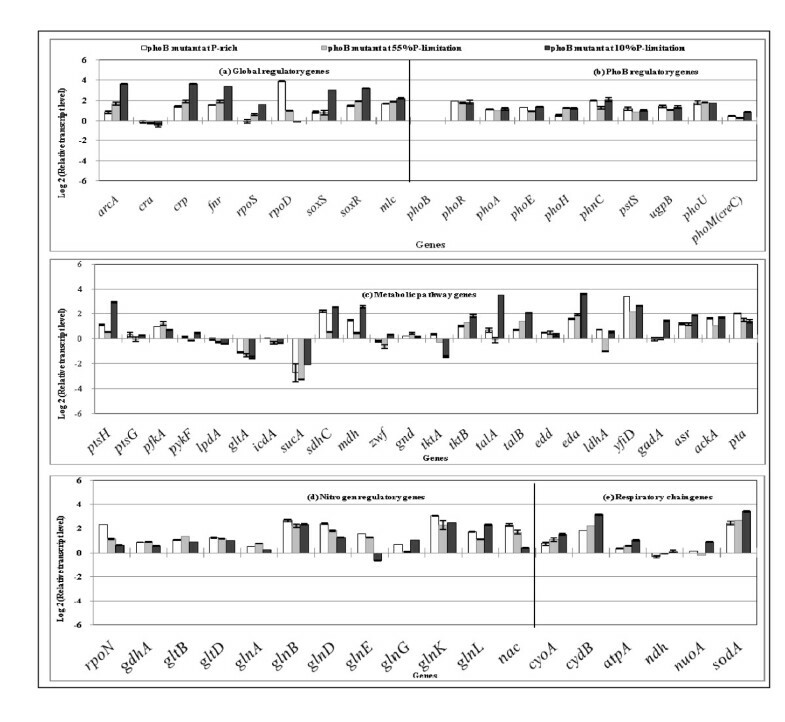 Figure 1a also indicates that the transcript level of arcA increased as P concentration decreases, and those of sdhC and mdh genes decreased (Figure 1c and Additional file 2). 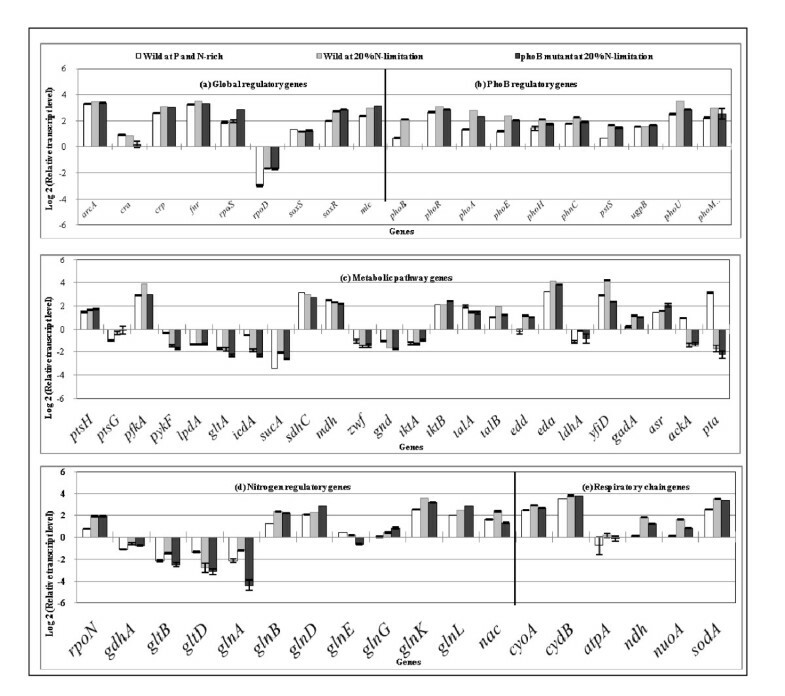 Figure 1 also shows that cra transcript level decreased, and thus the transcript levels of ptsH and pykF increased (Additional file 2). Those are consistent with the increased specific glucose consumption rate (Table 1 and Additional file 1a). The decrease in cra transcript level may be due to higher glucose concentration. The transcript level of fnr is somewhat different from arcA but that of yfiD changed in a similar fashion as fnr (Additional file 2). Moreover, Figure 1a also indicates that soxR/S transcript levels increased as P concentration decreases, and accordingly the transcript levels of rpoD, zwf and sodA changed in a similar fashion (Additional file 2). The respiratory chain genes such as atpA, ndh, and nuoA also changed in a similar fashion, implying that the respiration is activated under P-limitation. Figure 1d shows that rpoN which encode σ54 increases as P concentration decreased. Comparison of the transcript levels of the wild type E. coli cultivated with different P concentrations of the feed (100%, 55%, 10%): (a) global regulatory genes, (b) PhoB regulatory genes, (c) metabolic pathway genes, (d) nitrogen regulatory genes, and (e) respiratory chain genes. Table 1 also shows the effect of phoB gene knockout on the fermentation characteristics under both P-rich and lower P conditions, where it indicates that the glucose concentration increased and cell concentration decreased for the phoB mutant as compared to the wild type, and that the specific acetate production rate was higher at P-rich condition and 55% of P concentration for the phoB mutant as compared to the wild type. It is surprising that the fermentation characteristics were less affected even under P-limitation (10% and 5%) for the phoB mutant, whereas the wild type shows significant changes at 10% of P concentration. In the case of phoB mutant, cell could survive even at 1% of P concentration (Table 1 and Additional file 1b). Figure 2 indicates that the transcript levels of PhoB regulated genes such as phoA, phoE, phoH, pstS, ugpB and phoM were down-regulated, whereas phoR and phoU changed little, as compared to those of wild type. In a similar fashion as the wild type, the transcript level of arcA increased while cra decreased as P concentration decreased for the phoB mutant, which implies that those phenomena are phoB independent. The transcript levels of soxR and rpoS increased and sodA as well as respiratory chain genes such as cyoA, ndh and nuoA increased in a similar fashion as P concentration decreased for the phoB mutant, which implies that the activation of the respiratory chain is phoB-independent, but P-concentration dependent. Comparison of the transcript levels of the phoB mutant E. coli cultivated with different P concentrations of the feed (100%, 55%, 10%): (a) global regulatory genes, (b) PhoB regulatory genes, (c) metabolic pathway genes, (d) nitrogen regulatory, and (e) respiratory chain genes. In order to confirm the result for phoB mutant, the effect of phoR gene knockout on fermentation characteristics and some selected gene transcript levels were also investigated for the case of 10% of P concentration as given in Table 1 and Figure 3. Table 1 indicates that the cell concentration and the glucose concentration for phoR mutant are similar to those of phoB mutant, whereas acetate concentration became quite low at P-limiting condition for the phoR mutant. Figure 3 indicates that the phoB regulated genes such as phoA, phoE, phoH, phnC, pstS, ugpB were more down-regulated for the phoR mutant as compared to phoB mutant, whereas phoU and phoM (creC) were less affected by phoR gene knockout. Comparison of the transcript levels of Pho regulon genes for the wild type, phoB and phoR mutants cultivated at 10% P- concentration. Table 2 shows the effect of pH and phosphate limitation on the fermentation characteristics in the continuous culture of E. coli at the dilution rate of 0.2 h-1, where it indicates that more acetate was formed with higher glucose uptake rate, while the cell concentration became lower at pH 6.0 as compared to the case of pH 7.0. Note that the fermentation characteristics were different even between 100% and 55% of phosphate concentration under lower pH value. Figure 4 shows the effect of culture pH on the transcript levels, where it indicates that arcA gene was up-regulated (P < 0.01), and the TCA cycle genes such as sdhC and mdh were down-regulated accordingly (P < 0.01 and P < 0.01, respectively). Note that icdA gene was up-regulated (P < 0.01), which coincided with the up-regulation of cra gene (P < 0.01) (Additional file 2). Figure 4 also shows that the transcript level of rpoS was up-regulated, and the expression of gadA (glutamate decarboxylase) gene was up-regulated at pH 6.0 . The yfiD gene, which encodes acid-inducible protein , was also up-regulated at lower pH. Figure 4 also shows that phoB gene was up-regulated and the PhoB regulated genes such as phoA, phoE, phoH, phnC, pstS, and ugpB as well as phoR, phoU, phoM and eda were up-regulated (P < 0.01 for all genes). This means that acid stress and phosphate regulation are directly or indirectly interconnected . Fermentation characteristics of the wild type E. coli and its phoB mutant in the aerobic chemostat culture under two phosphate concentrations (100% and 55%) and two pH values (7.0 and 6.0) at the dilution rate of 0.2 h-1. Comparison of the transcript levels of the wild type and its phoB mutant cultivated under different pH condition and different P concentrations: (a) global regulatory genes, (b) PhoB regulated genes, (c) metabolic pathway genes, and (d) respiratory chain genes. Figure 4 also shows the effects of lower pH and lower P-concentration on the transcript levels (3rd bars), where phoB gene was further up-regulated, and the Pho regulon genes such as phoR, phoH, phnC, pstS, ugpB, and phoU were all further up-regulated at lower P concentration at pH 6.0. The rpoS gene further increased (P < 0.01), and gadA gene was also further up-regulated (P < 0.01). Figure 4 shows that arcA transcript level tended to be up-regulated though not significant, and this may have caused down-regulations of sdhC and mdh (P < 0.01 and P < 0.01, respectively) under P-limitation as compared to P-rich condition at acidic condition. Table 2 shows the effects of lowering pH and P concentration on the fermentation characteristics of phoB gene knockout mutant as well, where it indicates that the glucose concentration increased for the phoB mutant as compared to the wild type under both pH 7.0 and 6.0. 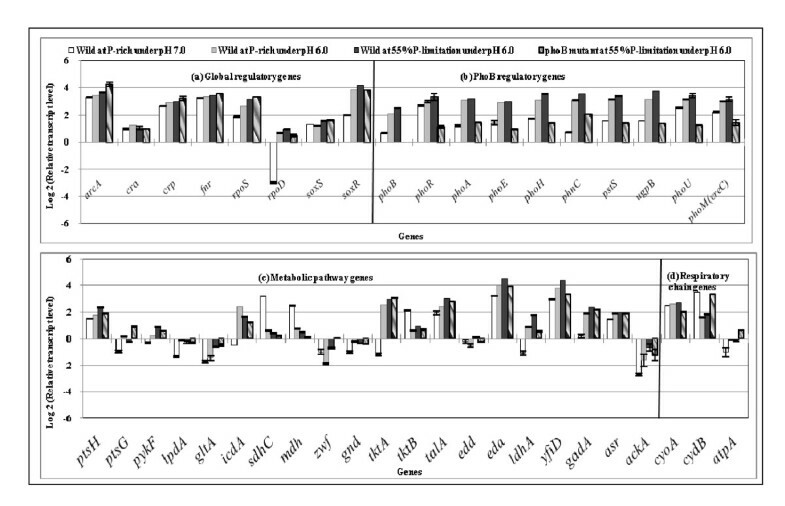 Figure 4 shows the comparison of the transcript levels between the wild type (3rd bars) and its phoB mutant (4th bars) at pH 6.0, where it indicates that the phoB regulated genes such as phoA, phoE, phoH, phnC, pstS, ugpB (P < 0.01 for all genes) as well as phoR, phoU, phoM and eda were all significantly down-regulated (P < 0.01 for all genes) for the phoB mutant. The transcript levels of TCA cycle genes such as sdhC and mdh were down-regulated for the phoB mutant as compared to the wild type. 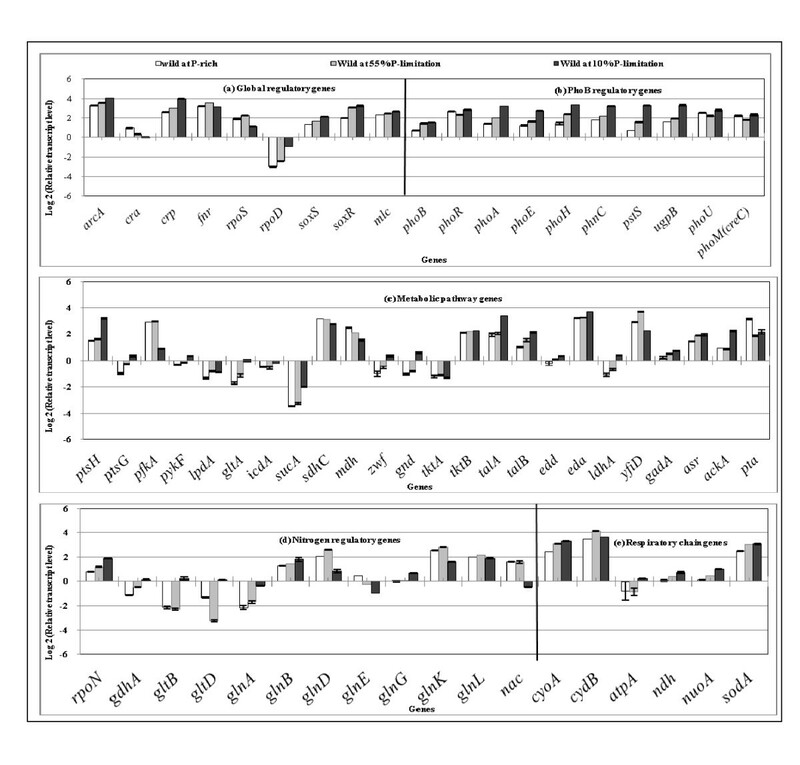 Table 3 shows the effect of nitrogen (N) limitation and lower P concentration on the fermentation characteristics, where the specific glucose consumption rate and the specific acetate production rate increased, while cell concentration decreased for the case of N-limitation as compared to N-rich condition. Those changes were further enhanced at lower P concentration. Figure 5 shows the effect of N-limitation on the transcript levels of several genes, where it indicates that rpoN transcript level increased and glnA, L, G, gltB, glnD, glnK and nac genes were up-regulated (P < 0.01 for all genes), while glnE gene was down-regulated (P < 0.01). Figure 5 also shows that the transcript level of phoB gene was up-regulated and PhoB regulated genes such as phoA, phoE, phoH, phnC, pstS were increased (P < 0.01 for all genes) as well as phoR, phoU, and phoM (P < 0.01 for all genes) under N-limitation as compared to N-rich condition. The TCA cycle genes such as sdhC and mdh decreased (P < 0.01 for both genes), which may have caused TCA cycle to be repressed, which corresponds to the increase in the specific acetate production rate. The ptsG, ptsH and pfkA gene expressions increased (P < 0.01 for all genes), which corresponds to the increase in the specific glucose consumption rate. The transcript levels of fnr and yfiD were up-regulated (P < 0.01 for both genes) in a similar fashion. Moreover soxR increased and the respiratory chain genes such as cyoA, cydB, ndh and nuoA as well as sodA were all up-regulated under N-limitation (P < 0.01 for all genes). Fermentation characteristics of the wild type E. coli and its phoB mutant in the aerobic chemostat culture under different nitrogen and phosphate concentrations at the dilution rate of 0.2 h-1 at pH 7.0. Note: The standard deviation was obtained by triplicate measurements. Comparison of the transcript levels of the wild type cultivated at 100% and 20% N-limitation and phoB mutant cultivated at 20% N-limitation: (a) global regulatory genes, (b) PhoB regulatory genes, (c) nitrogen regulatory genes, (d) metabolic pathway genes, and (e) respiratory chain genes. Table 3 also shows the effect of lower P concentration on the fermentation characteristics of phoB mutant under N-limitation, where it indicates that the cell concentration decreased, while acetate and glucose concentrations increased under N-limitation as compared to N-rich condition for the phoB mutant. 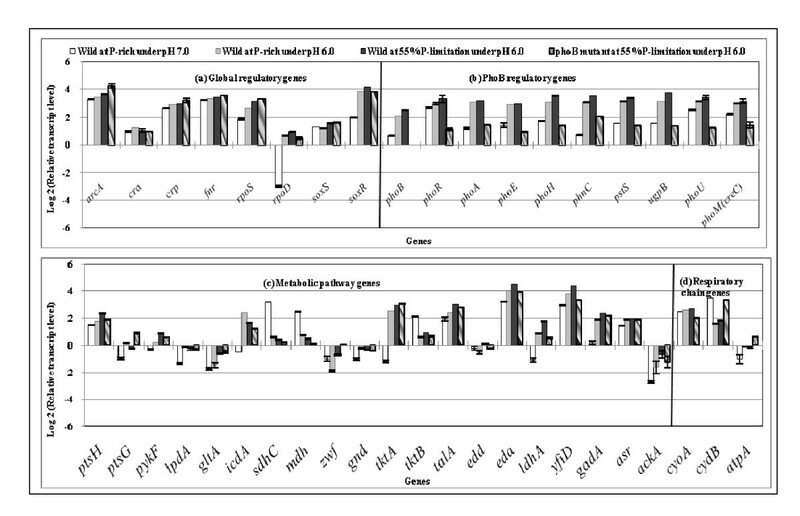 Figure 5 indicates (by comparison of the 2nd and 3rd bars) that phoB regulated genes such as phoA, phoE, phnC, pstS, phoR, phoU, (P < 0.01 for all genes) as well as phoH and phoM were down-regulated (P < 0.05 for the two genes) as compared to the wild type. Although rpoN transcript level changed little, such genes as glnD, glnG, glnL were up-regulated (P < 0.01 for all genes), whereas gltD (P < 0.5), and glnA, glnE, glnK, nac genes were down-regulated (P < 0.01 for all genes). It was shown that the glycolysis was activated under phosphate limiting condition by the data of the specific growth rate (Table 1) and by the corresponding gene transcript levels (Figure 1). This may be due to ATP demand caused by the decrease in ATP formation with limited amount of available phosphate as implied by Kobeman et al. who investigated the effect of [ATP]/[ADP] ratio on the glycolytic flux. The lower cell concentration under P-limitation may also be due to lower ATP formation as we investigated previously on the relationship between the cell growth rate and the specific ATP production rate [41, 42]. Moreover, phosphate limitation causes less ATP production by H+-ATPase, which causes less quinol oxidation by Cyo, which in turn affected quinone pool size, and thus activate ArcA/B, which represses the TCA cycle genes, and in turn produced more acetate. The similar situation has also been seen in cyoA and cydB genes knockout mutants in our previous investigation . Figure 1b indicates that phoB gene transcript level increased as P concentration decreases in the wild type, and Figure 1a indicates that rpoD also increased as P concentration decreases. The phoA, phoE, phoH, phnC, pstS, and ugpB were all increased in a similar fashion as that of rpoD as mentioned in the result section. Figure 1a indicates that the expression pattern of rpoS is somewhat different. When cells enter into Pi-starvation phase in the batch culture, the Pho regulon is activated, and σS starts to accumulate in the cytosol [1, 44, 45]. The promoters of the Pho genes are recognized by σD - associated RNA polymerase. A mutation in rpoS, significantly increases the level of AP (Alkaline phosphatase) activity, and the overexpression of σS inhibits it . It has been reported that in rpoS mutant, the expression of AP was considerably higher than in wild-type strain, implying that σS is involved in the regulation of AP. Other Pho genes such as phoE and ugpB are likewise affected by σS. The rpoS may inhibit the transcriptions of phoA, phoB, phoE, and ugpB, but not that of pstS. Figure 1ab indicates that Pho genes are highly expressed as compared to low rpoS transcript level in the case of P-limitation. In contrast, pst may be transcribed by both σS and σD. The Pho regulon is thus evolved to maintain a trade-off between cell nutrition and cell survival during Pi-starvation . The previous reports suggest that the Pho regulon and the stress response are interrelated [45–50]. E. coli cells have been demonstrated to exhibit acid resistance by such genes as gadAB which encode glutamate decarboxylase and gadC which encodes glutamate: γ-amino butyric acid (GABA) antiporter. Glutamate decarboxylase production has been shown to increase in response to acid, osmotic and stationary phase signals [51, 52]. In the typical batch culture, organic acids are most accumulated at the late growth phase or the stationary phase. It was shown that gadA was PhoB-dependently up-regulated in the present study (Figure 4), and this indicates that this gene is indirectly regulated by PhoB. Note that Figure 4 indicates that gadA gene expression decreased for the phoB mutant under acidic condition (4th bar), while rpoS increased. This suggests that phosphate starvation and acid stress responses may be interconnected . Figure 4 also indicates that yfiD transcript level increased at acidic condition. It has been shown that the expression of yfiD gene is induced at acidic condition, and this reduces the accumulation of acidic metabolite and products . The anaerobic transcription factor Fnr (Fumarate and nitrate reduction regulator) has been shown to be the major regulator of yfiD expression, and ArcA was shown to enhance anaerobic yfiD expression . Figure 4 indicates that yfiD transcript level changed in a similar fashion as rpoD rather than arcA and fnr. It has been known that the transcriptional regulator Fnr of E. coli functions as an O2 sensor, and the protein is in the active form and predominately exists as a homo-dimer with one [4Fe-4S] cluster per monomer under anoxic conditions. In the presence of oxygen, [4Fe-4S] FNR is converted to [2Fe-2S] FNR cluster and finally to apoFnr, which is no longer active in gene regulation [53, 54]. Nevertheless, fnr gene transcript level changed, which indicates that Fnr does not play its conventional role, and may have some role under aerobiosis, but it is not clear at this stage. Figure 4 also indicates that soxR increased at acidic condition. The acidic condition may affect membrane properties such as lipid content, thus effectively changing the proton permeability. The increased expression of soxR regulates the removal of damaging oxidizing agents . As expected, the acid inducible asr gene transcript level increased at pH 6.0 as compared to the case at pH 7.0 as shown in Figure 4c. The asr gene has been reported to be under the transcriptional control of the PhoR/PhoB two component system in E. coli. Figure 1c indicates that asr gene transcript level increased as P concentration decreases in accordance with the change in phoB transcript level. Asr is thought to play a role similar to that of the E. coli periplasmic protein HdeA, which serves as a proton sink or a chaperone for protecting periplasmic proteins from the deleterious effects at lower pH . As another example, the PhoR/PhoB system has been suggested to sense external acidity and regulate the transcription of genes that are important for acid shock resistance [56, 58–61]. The presence of glucose or mutations in cya or cAMP receptor protein (crp) gene leads to induction of phoA gene in phoR mutant. This induction requires the sensor PhoM (CreC) and the regulator PhoB . However, PhoM (CreC) may not detect glucose per se, where it may detect an intermediate in the central metabolism. Therefore, cya or crp mutation may indirectly affect PhoM (CreC) - dependent control. In addition to Pi control, two Pi-independent controls may lead to activation of PhoB. These two may be connected to control pathways in carbon and energy metabolisms, in which intracellular Pi is incorporated into ATP. One Pi independent control is the regulation by the synthesis of AcP, where Pi is incorporated into ATP at Ack (acetate kinase) pathway. AcP may act indirectly on PhoB. In E. coli, assimilation of N-source such as NH4+ using α-KG results in the synthesis of glutamate and glutamine. Glutamine synthetase (GS encoded by glnA) catalyzes the only pathway for glutamine biosynthesis. Glutamate can be synthesized by two pathways through combined actions of GS and glutamate synthase (GOGAT encoded by gltBD) forming GS/GOGAT cycle, or by glutamate dehydrogenase (GDH encoded by gdhA). Under N-limitation, ammonium enters into the cell via AmtB and is converted to Gln by GS, and UTase (encoded by glnE) uridylylates both GlnK (encoded by glnK) and GlnB (encoded by glnB) . Figure 5d (1st and 2nd bars) indicates that rpoN increased under N-limitation, and glnALG, glnB, glnK as well as nac genes increased as stated above. On the other hand, under N-rich condition, UTase deurydylylates GlnK and GlnB. GlnK complexes with AmtB, thereby inhibiting the transporter via AmtB, where GlnB interacts with NtrB (encoded by glnL) and activates its phosphatase activity leading to dephosphorylation of NtrC (encoded by glnG), and NtrC- dependent gene expression ceases , thus the nitrogen regulation is affected by the phosphorylation caused by the available P source. Figure 5d (2nd and 3rd bars) indicates that glnB and glnK transcript levels decreased, and glnA transcript level became lower under P-limitation as compared to P-rich condition under N-limitation. In the case under N-limitation, C/N ratio increases where α-KG is withdrawn via GDH, which affects the TCA cycle flux. A decreased flow through the TCA cycle would be expected to cause an increase in AcCoA pool and caused more acetate overflow. Although little research has been done, it is quite important in practice to analyze the metabolism at the late growth phase and the stationary phase in the batch culture, where the medium is nutrient poor indicating carbon, phosphorous, and nitrogen limitations, as well as lower pH. When a particular nutrient becomes limiting, the first response is scavenging. These scavenging regulons include cAMP-Crp which allows for the use of alternative carbon sources such as acetate, and the two-component regulatory systems PhoR/PhoB and NtrB/NtrC, which control scavenging for phosphorus and nitrogen, respectively. Both Crp and Ntr systems survey nutrient status through intracellular metabolites, where Crp recognizes cAMP, while NtrC responds to glutamine. The Pho system, on the other hand, monitors inorganic phosphate levels via the activity of the Pst transport system . The sigma factor responsible for the general stress resistance is RpoS (σ38) upon starvation. Note that the housekeeping sigma factor RpoD (σ70) is homologous to RpoS. Carbon starvation is one of the strongest inducers of RpoS, where regulation of RpoS occurs at the level of proteolysis by C1pXP. This regulation is made by sprE, which encodes a response regulator SprE (also called RssB) . RpoS plays also an important role under phosphate limiting condition. However, its regulation mechanism is different. Note that while carbon starvation completely shuts down the central metabolism, it continues upon phosphate starvation . In contrast to carbon and nitrogen starvation, the PhoR/PhoB two component system, either directly or indirectly regulates the translation of rpoS mRNA . Since PhoB is a transcriptional regulator, its effects on rpoS translation may be indirect, where small noncoding RNAs (sRNAs) are important regulators of translation of mRNA. The sRNAs require the RNA chaperone Hfq for the formation of the RNA-RNA duplex, and there are several RNAs known to affect rpoS translation . Namely, impeding phosphorous starvation is sensed as diminished activity of the Pst transporter, which causes autophosphorylation of PhoR, which then phosphorylate PhoB. The phosphorylated PhoB directly or indirectly activates transcription of an sRNA that stimulates translation of rpoS mRNA, thus elevating levels of RpoS . Note that the regulation may be more complicated, since Figure 2a indicates that rpoS level increased as P concentration decreases even for the phoB mutant as also noted by Peterson et al. . Upon nitrogen starvation, ppGpp levels were known to increase, and there might be some correlations between levels of ppGpp and RpoS levels. RpoS is not stabilized upon nitrogen starvation like it is upon carbon starvation or phosphate starvation, and thus the regulation mechanism may be different, suggesting an increase in the activity of RpoS. . Similar proteins are induced following starvation for carbon, phosphorous and nitrogen [67, 68], where RpoS-dependent genes are induced upon starvation. Although the activity of RpoS seems to be critical for nitrogen starvation, there are many players that affect the competition between RpoS and RpoD, including Rsd, 6S RNA, and ppGpp . The role that the NtrB/C nitrogen scavenging system plays in regulating RpoS is unclear. The overall regulation mechanism may be illustrated schematically as Figure 6. Schematic illustrations for the metabolic regulation mechanism. Similar mechanism might exist in phoB mutant E. coli, and further investigation is needed to clarify this. Finally, it seems to be surprising that phoB (and also phoR) mutant could survive even under strict P limiting condition as compared to wild type as shown in Table 1 and Additional file 1. Figure 2 indicates that Pho regulon genes were insensitive to P concentration as expected, whereas global regulatory genes (Figure 2a), metabolic pathway genes (Figure 2c), and respiratory chain genes (Figure 2e) changed significantly. It has recently been reported that phoB mutant was more sensitive to hydrogen peroxide, but that phoB mutant was more resistant to high osmolarity and acid conditions compared to the wild type of Vibrio cholerae. The present investigation clarified the effect of phosphate limitation, nitrogen limitation, and acidic condition on the metabolism in view of gene transcript levels. Moreover, the present study implies that the metabolic regulations under phosphate limitation, nitrogen limitation and acidic condition are interconnected. These phenomena occur at the late growth phase in the batch culture. The present result is useful for the analysis of the metabolism changes during late growth phase and/or stationary phase. The strains used in the present study were Escherichia coli BW25113 (lacI q rrnB T14 ΔlacZ wJ16 hsdR514 ΔaraBAD AH33 ΔrhaBAD LD78 ), its phoB gene knockout mutant (JW0389) and phoR mutant (JW0390). The mutants were constructed by one-step inactivation of chromosomal phoB and phoR genes, respectively . Continuous cultivations were carried out in a 2-L fermentor (M-100, Tokyo, Rikakiki Co., Tokyo, Japan), where the temperature was kept constant at 37°C. The pH of the broth was maintained either at 7.0 ± 0.1 or 6.0 ± 0.1 with a pH controller by automatic addition of 2.0 M HCl or 2.0 M NaOH. The aerobic condition was ascertained by controlling the stirring speed at 350 rpm with the constant air flow rate of 1 L min-1, which has been shown to be 30-40% of air saturation. The CO2 and O2 concentrations were monitored using an off-gas analyzer (BMJ-02 PI, ABLE Co., Japan). The M9 minimal medium was used where it contained 10 g of glucose per liter, 48 mM Na2HPO4,, 22 mM KH2PO4, 10 mM NaCl, and 30 mM (NH4)2SO4. The following components were filter sterilized and then added (per liter of final medium): 1 ml of 1 M MgSO4, 1 ml of 0.1 mM CaCl2, 1 ml of 1 mg of vitamin B1 per liter, and 10 ml of trace element solution containing (per liter) 0.55 g of CaCl2.2H2O, 1.67 g of FeCl3, 0.10 g of MnCl2.4H2O, 0.17 g of ZnCl2, 0.043 g of CuCl2.2H2O, 0.06 g of CoCl2.6H2O and 0.06 g Na2MoO4.2H2O. Continuous cultivations were performed at the dilution rate of 0.2 h-1, where the feed glucose concentration was 10 g/L, and several different phosphate concentrations were considered: P-rich or 100% P concentration (2.99 g/L of KH2PO4 and 6.81 g/L of Na2HPO4) and P-limitation or 10% of P concentration (0.229 g/L of KH2PO4 and 0.681 g/L of Na2HPO4). Several other P concentrations in between were also investigated. For the nitrogen limited condition, 6.0 mM of (NH4)2SO4 was used instead of 30.0 mM. The continuous (chemostate) culture was controlled by adjusting the rotation speed of input and output pumps of the fermentor, where the rotation speed of output pump was adjusted to keep the broth volume constant, while the rotation speed of input pump was adjusted to set the dilution rate. In the present investigation, the dilution rate was set at 0.2 h-1, where glucose limitation was not observed at such dilution rate. If the dilution rate was decreased less than about 0.1 h-1, the glucose concentration becomes undetectable level, and both glucose and phosphate limitation may occur, and the changes of the transcript levels may be direct or indirect. To avoid such situation, we set the dilution rate to be at 0.2 h-1. The triplicate samples were taken after 4-5 residence times where the steady state was ascertained. Cell concentration was measured by the optical density (OD) of the culture broth at 600 nm wave length with a spectrophotometer (Ubet-30, Jasco Co., Tokyo, Japan), and then converted to dry cell weight (DCW) per liter based on the relationship between OD600nm and DCW previously obtained . Glucose concentration was measured using enzymatic kit (Wako Co., Osaka, Japan). Acetate and lactate concentrations were also measured using enzymatic kits (Boehringer Co., Mannheim, Germany). Triplicate measurements were made for each sample to compute the standard deviation. Total RNA was isolated from E. coli cells by Qiagen RNeasy Mini Kit (QIAGEN K.K., Japan) according to the manufacturer's recommendation. The quantity and purity of the RNA were determined by the optical density measurements at 260 and 280 nm and by 1% formaldehyde agarose gel electrophoresis. Criteria for the design of the gene-specific primer pairs were followed according to Sambrook and Russel . The primers used in this study were described elsewhere [73, 74], except those as given in additional file 3. The primers used in this study were synthesized at Hokkaido System Science Co. (Sapporo, Hokkaido Japan). In all cases, the primer-supplied company confirmed the absolute specificity of the primers. RT-PCR reactions were carried out in a TaKaRa PCR Thermal Cycler (TaKaRa TP240, Japan) using Qiagen One Step RT-PCR Kit (QIAGEN K.K., Japan). The reaction mixture was incubated for 30 min at 50°C for reverse transcription (cDNA synthesis) followed by 15 min incubation at 95°C for initial PCR activation. Then the process was subjected to 30 cycles of amplification which consisted of a denaturing step (94°C for 1 min), annealing step (approximately 5°C below melting temperature, of primers for 1 min), and an extension step (72°C for 1 min), and finally the reaction mixture of 25 μl was subjected for 10 min at 72°C for final extension. To check for nucleic acid contamination, one negative control was run in every round of RT-PCR. This control lacks the template RNA in order to detect possible contamination of the reaction components. 5 μl of amplified products were run on 1.8% agarose gel. Gels were stained with 1 mg ml-1 of ethidium bromide, photographed using a Digital Image Stocker (DS-30, FAS III, Toyobo, Osaka, Japan) under UV light and analyzed using Gel-Pro Analyzer 3.1 (Toyobo, Osaka, Japan) software. In order to determine the optimal amount of input RNA, the two-fold diluted template RNA was amplified in RT-PCR assay under identical reaction condition to construct a standard curve for each gene product. When the optimal amount of input RNA was determined for each gene product, RT-PCR was carried out under identical reaction condition to detect differential transcript levels of genes. The gene dnaA, which encodes E. coli DNA polymerase and is not subjected to variable expression, i.e. abundant expression at relatively constant rate in most cells, was used as an internal control in the RT-PCR determinations. The gene expressions are given as relative values to that of dnaA. The selection of genes was made based on global regulator-metabolic pathway gene relationships (Additional file 2). To calculate the standard deviation, RT-PCR was independently performed three times under identical reaction condition. To ensure that the observed expression changes were statistically significant, the Student's t-test was applied. This research was supported by Strategic International Cooperative Program, Japan Science and Technology Agency (JST). The authors are pleased to mention about the fruitful discussions with Prof. Johnjoe McFadden of Surrey University and Prof. Hans Westerhoff of Manchester University. LWM carried out fermentation experiments, assayed, made statistical analysis, and drafted the manuscript. KS considered the experimental design, analyzed the result, and prepared the manuscript together with LWM. All authors read and approved the final manuscript.